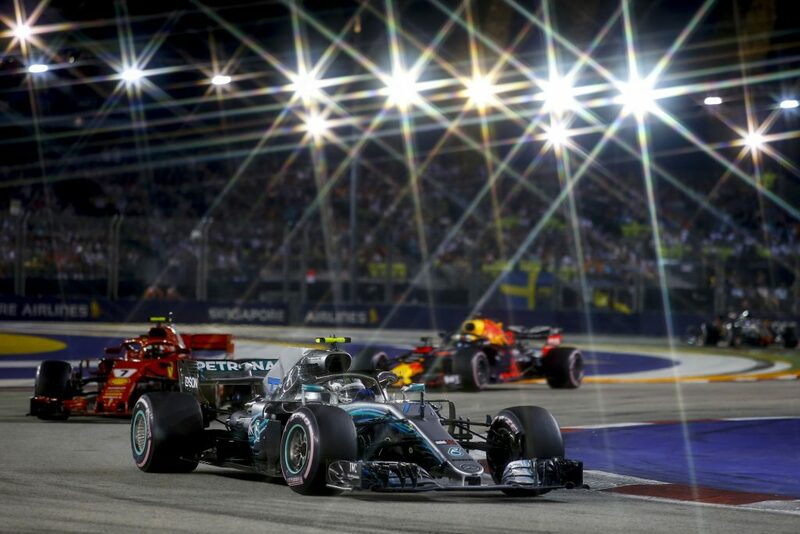 Lewis Hamilton won the Singapore Grand Prix with a conservative one-stop strategy to stretch his championship lead over Sebastian Vettel to 40 points, but while the Briton’s lead was never really threatened, the Mercedes car arguably should never have been so comfortably positioned at the head of the field. 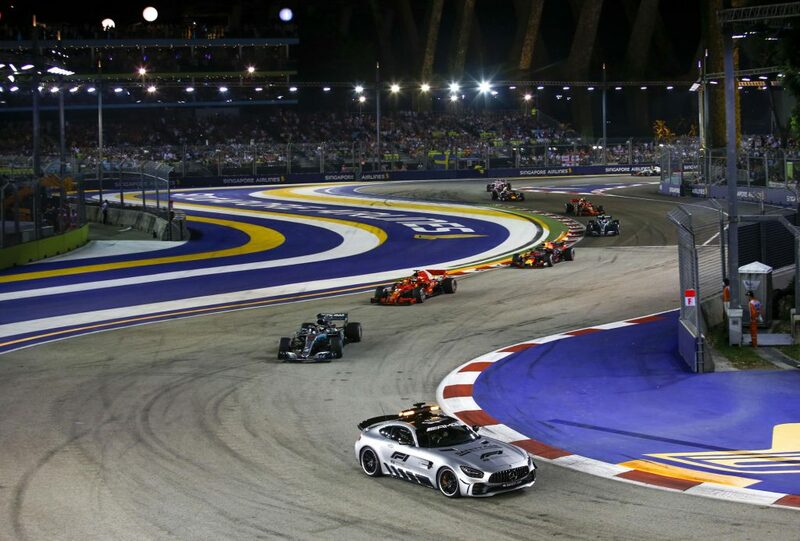 Hamilton’s tyre management was only the second half of Mercedes’s efforts to undermine Ferrari’s attempted to revive its rapidly flagging title hopes; qualifying was the real key to owning the Marina Bay streets. Expectations were high that Singapore would allow Ferrari to rebuild its championship campaign after the disappointment of the Italian Grand Prix, and these optimistic foundations were solid enough — Vettel was a four-time winner in Singapore, Ferrari has typically performed well at the circuit and Mercedes has frequently struggled with the unique demands of the Marina Bay streets. 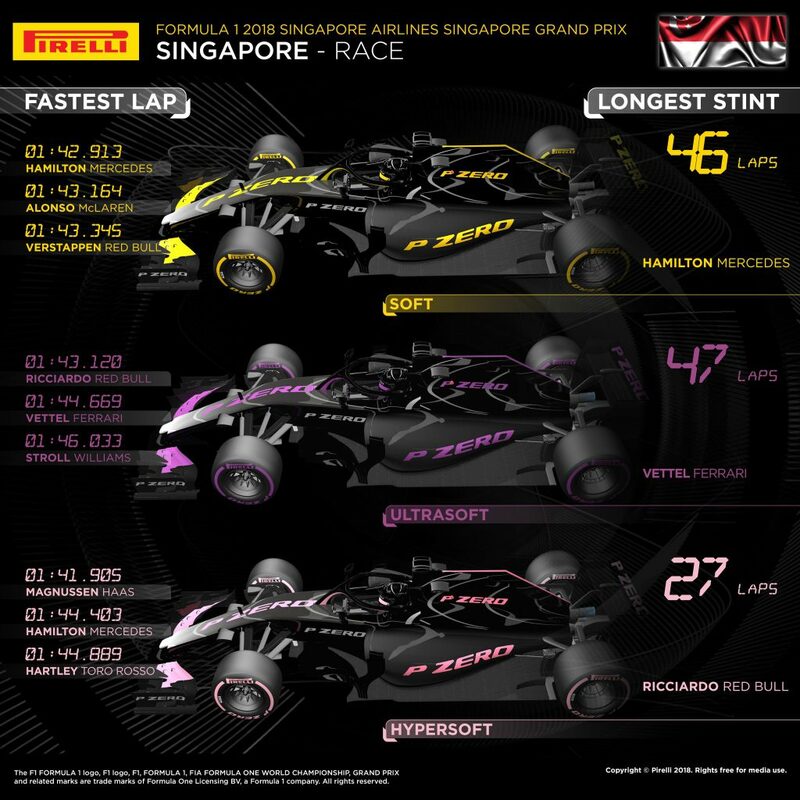 Pirelli brought the hypersoft, ultrasoft and soft compounds — skipping the supersoft tyre in a bid to create more strategic variation — to Singapore, which also theoretically benefitted Ferrari given Mercedes tends to struggle with the softest tyres in the range. 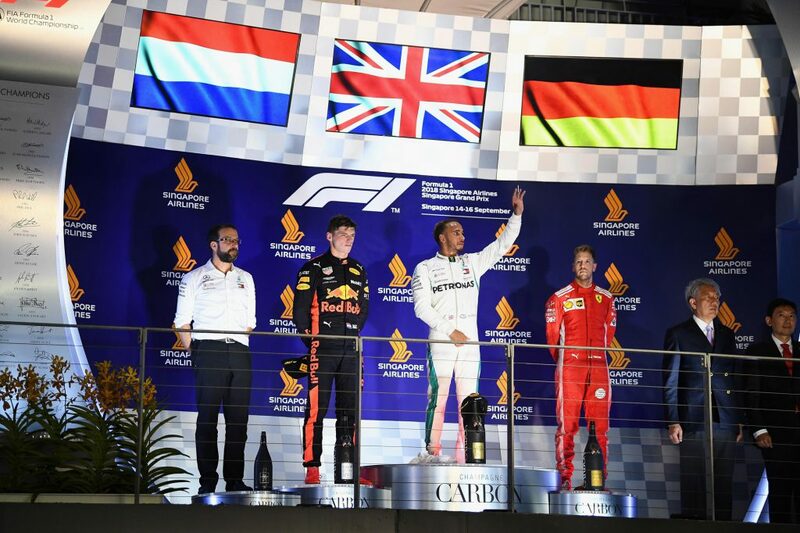 The above tenants were true right up until Hamilton blitzed Vettel by 0.6 seconds, a margin significant enough for Red Bull Racing’s Max Verstappen to slot between the two title protagonists. The culprit for Ferrari’s underperformance was an inability to keep the delicate hypersoft tyre in its correct temperature window. Vettel also wasn’t helped by operational problems throughout the session, including a needless disruption in Q2 when the team sent him out on the ultrasoft tyre in an attempt to set it as his race start compound. He was forced to undertake an all-or-nothing hypersoft run subsequently, which was hampered by traffic. The culmination of these problems meant Vettel and Raikkonen missed out on crucial laps to push the limits of the tyre ahead of Q3, and it also deprived Ferrari of an opportunity to fine-tune its approach to tyre warm-up. Given the importance of qualifying and track position at street circuits, Ferrari and Vettel’s inability to manage the session proved extremely costly by Sunday. 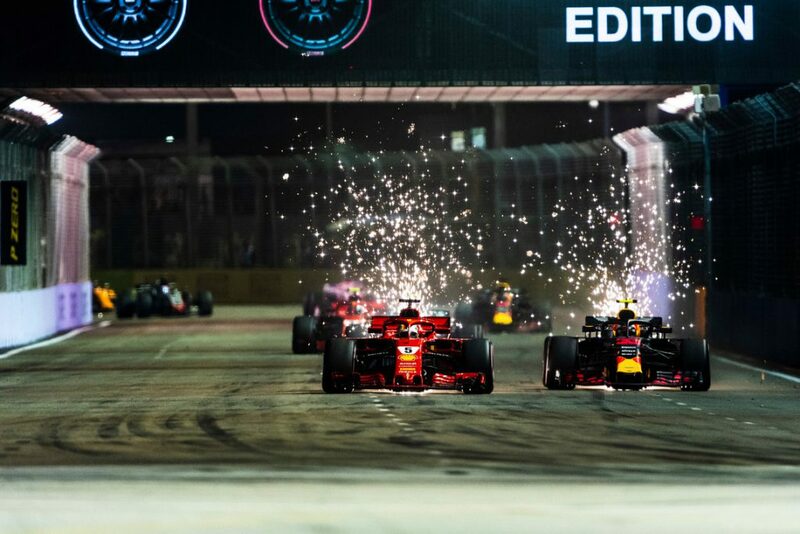 Vettel stole second place from Verstappen on the first lap, but the race thereafter entered a lull as all hypersoft starters tried to extend tyre life for as long as possible to make a one-stop race feasible. A four-lap safety car to clear Esteban Ocon’s crashed Force India car triggered on lap one helped in this regard. A game of cat and mouse ensued between Hamilton and Vettel, the chaser keeping within 1.5 seconds of the leader, until Hamilton opened the taps from lap 12. His lap times dropped by around three seconds, attempting to guard against the undercut. 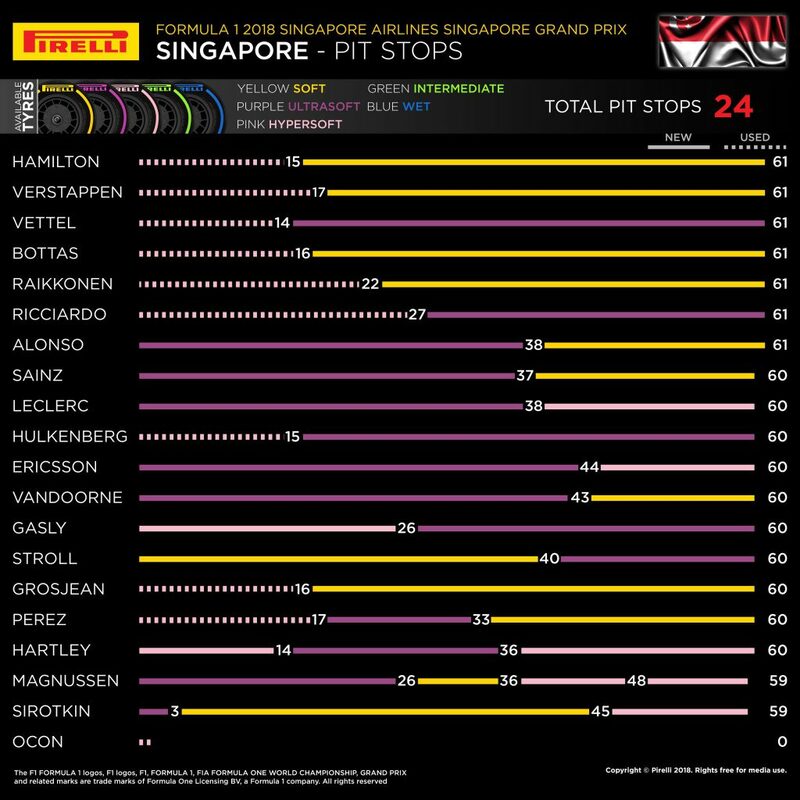 Vettel didn’t have the same performance left in his tyres and was forced to go aggressive, stopping on lap 14 to trigger the undercut for new ultrasofts — the purple-striped rubber would require extreme tyre management to make it to the end, but the soft compound wouldn’t be fast enough to give Vettel the lap-one speed burst he needed to try to trip up Hamilton. The idea, then, was to gain track position and worry about the rest later, but though it gained him a few tenths, it wasn’t enough to close the gap Hamilton had built. Worse, however, was that Vettel’s early stop had assumed he would be able to sweep past Sergio Perez, the last of the midfield cars still in his pit window. Instead he was held up for two extremely costly laps during which Red Bull Racing stopped Max Verstappen, who was able to jump the hamstrung Ferrari back into second place. Should Vettel have waited another two or three laps to pit ahead of Perez? The fear was that by then Hamilton would’ve opened too large a gap to undercut anyway — though presumably the assumption was the Force India driver on his worn tyres wouldn’t have been as hard to pass as he was. Daniel Ricciardo suffered a poor weekend by his standards. 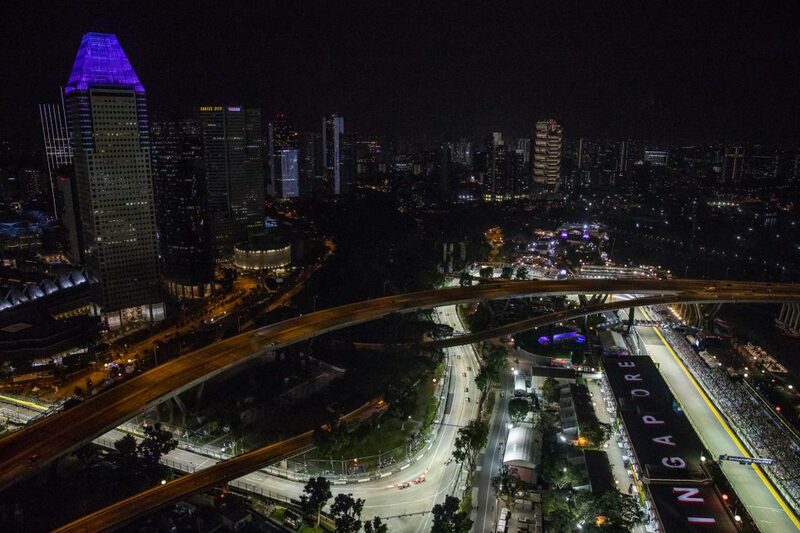 Never off the podium in Singapore since joining Red Bull Racing, the Australian qualified and finished sixth after being among a number of drivers who couldn’t get the hypersoft tyres into the sweet spot in qualifying. Given the difficulty of overtaking on street circuits, the only way he was going to make progress was to do something different to the other five frontrunners, which he did by taking his hypersoft tyres an impressive 27 laps — 30 laps in total taking into account qualifying — and switching to a long ultrasoft stint to the flag. Running long on the hypersoft tyre gave him the opportunity to take advantage of the high probability of a safety car, pitting under which would’ve jumped him ahead of his rivals, and using the ultrasoft tyre gave him reasonable pace in the second half of the race — but not enough to execute a pass, and he finished less than a second behind Kimi Raikkonen. Because a hypersoft-soft one-stop strategy required extreme tyre management and an early stop, those who started on the ultrasoft compound found themselves with a major strategic advantage, and in this sense those who started just outside the top 10 with free tyre choice profted significantly in the race over those who were forced to use the qualifying compound in the first stint by virtue of progressing through Q2. 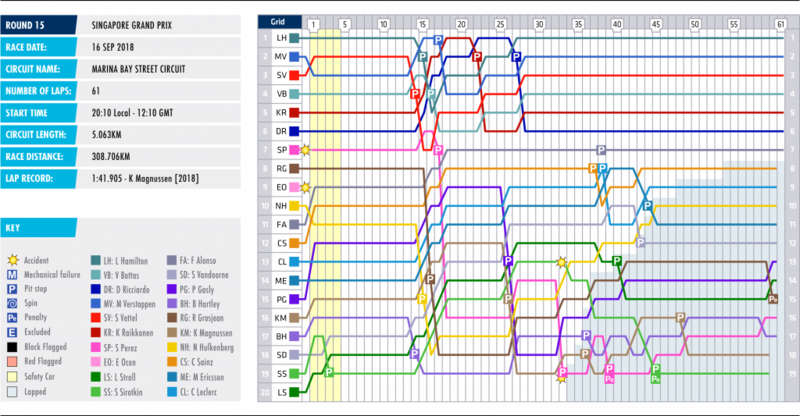 Fernando Alonso, Carlos Sainz and Charles Leclerc, starting from 11th, 12th and 13th on the grid, finished from seventh to ninth because they were able to run until between laps 37 and 38 before stopping, by which time they’d built up a significant gap on those who’d started ahead of them on hypersofts, allowing them to maintain position. 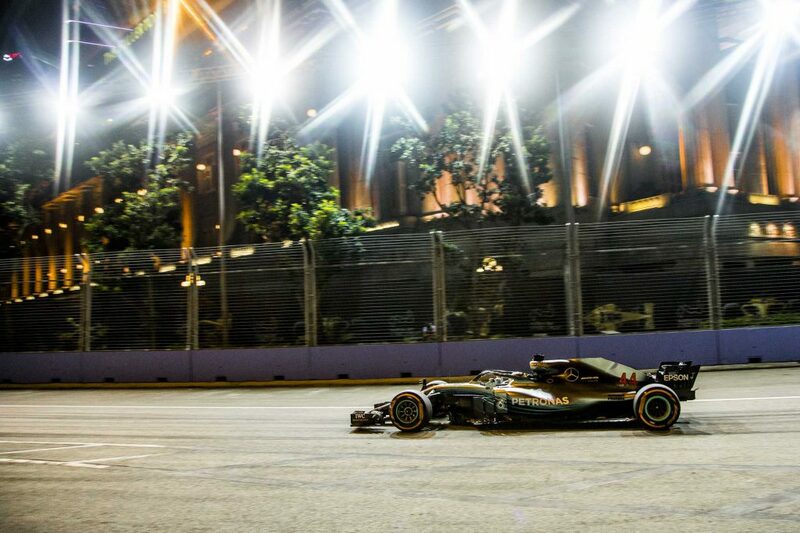 Contrast their fortunes with those of Nico Hulkenberg and Romain Grosjean. Both had to slog through slower traffic after their stops on laps 15 and 16 respectively — Grosjean lost a place to Hulkenberg in part thanks to the undercut and in part thanks to a slower in-lap. Hulkenberg made relatively rapid progress, which enabled him to finish 10th and in the points, whereas Grosjean struggled to get past both Williams cars in particular, which cost him valuable time. That, combined with him being generally off Hulkenberg’s pace, meant he was too back to jump Marcus Ericsson and Stoffel Vandoorne when they made their pit stops on laps 44 and 43. Sergio Perez was the worst example of this, however. He was stuck near the back of the field behind Sergey Sirotkin, who was defending superbly, from his first pit stop at the end of lap 17 until he crashed into him in a botched overtaking attempt on lap 39. Given the hypersoft was so out of favour as a race tyre, Toro Rosso’s decision to start Pierre Gasly and Brendon Hartley on the pink compound made no sense. Gasly got a bit of a boost off the line, passing two cars, but his progress, even considering his 26-lap stint, counted for little given his first pit stop dropped him to last bar one because the field was still so bunched up due to the severity of tyre management taking place. Hartley’s strategy made even less sense given he stopped on lap 14 — earlier than even those who started the race with used ultrasofts — and was subsequently committed to a two-stop strategy that delivered him 17th behind the penalised and damaged Force India of Sergio Perez.